Imagine you were in Gujarat in the year 1573 AD... a war between Emperor Akbar and the local Sultan would have provoked you to write a story. But the theme that would have inspired you was its wealth, not the disaster of the war. History tells us that Gujarat has always been the land of wealth. Its vanias (the merchant class) knew how to take the economic advantage from a political shift. And that is why Ahmedabad, unlike other Sultanate capitals such as Murshidabad or Bijapur has survived and remained prospered to these days. The key to this prosperity was however a port city - Khambat on the northern edge of a Gulf, now a crumbling town, heavily silted up with decaying population. Khambat, also known as Cambay has a trading history, unparallel in the Subcontinent. Ptolemy called it Camanes and described it as a flourishing port city and celebrated for its manufactures of silk, chintz and gold stuffs. In the Medieval world Khambat was not only a key to the success of Gujarat’s prosperity, but also to the great Mughal Empire. Khambat was the outlet for the overseas trade of Mughal Empire with Persian Gulf and East Africa. 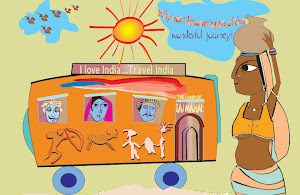 In about 1500 the city was the most important international trading port and was divided into ten territorial administrative units, six of which lay outside of Cambay region in Kathiawar, Kutch, Malwa and Rajputna, and the country south of the Tapti River. 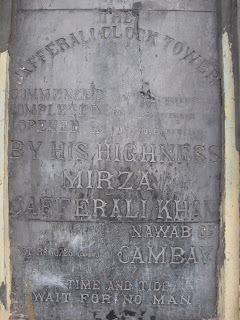 The most important among the Cambay merchants were the vanias and the Bhora Muslims, the former being the largest group. The vanias were organized collectively as mahajans – a body representing a group of people engaged in the same commercial activity, a governing council with an elected headman called sheth. We reached Khambat in the early evening of an early March day mainly to find and meet people in the agate bead making industry, a living Harappan craft, survived only at Khambat. 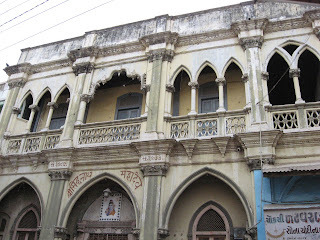 On our entry to Khambat what astonished us were the crumbling buildings of the Victorian era, mostly inherited by the Nawab of Cambay and his associates. The buildings though nothing to do with the medieval glory of Khambat but offered a glimpse of the prosperity of Khambat of yore. Today’s Khambat is a neglected region as it has fallen to the nature’s apathy. Its harbour once thrived with ships from Malacca, Persian Gulf, Mombasa and even Europe is now a dry bed of silts. Besides nature, the competition from the European companies, the shift of maritime trade to Surat and Mumbai and the coming of the railway to Gujarat in 1863 all led to the city’s eclipse. 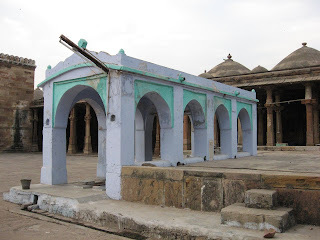 It’s once prospered Bhora Muslims and mahajans moved elsewhere allowing most of its heritage buildings to decay further. We saw some are being replaced with contemporary structures. 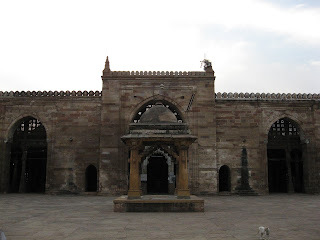 The only intact remains from the earlier time is however the splendid Juma Masjid, one of the earliest mosques of Gujarat built in the year of 1325 AD. Once located on the bank of the Gulf, in the local lore it is believed that ships from overseas used to anchor beside its wall. The sea has now receded about 2 km from the mosque. 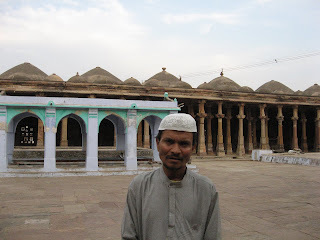 The Juma Masjid marked the beginning of medieval Gujarati architecture which was characterized by its integration of Hindu, Jain and Islamic forms. The absence of minars and the presence of toran inside the central arch are the evidence of fusions of three aesthetics, which later inspired Emperor Akbar to introduce while building his capital at Fathepur Sikri. 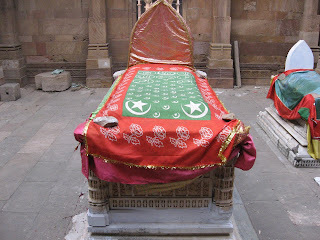 Khambat was a princely state during the British rule. 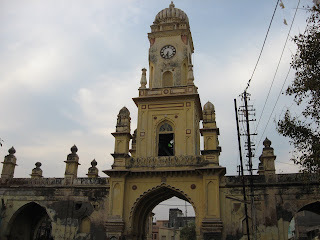 Its Nawabs had the privilege of the English education and access to the Victorian lifestyle and thereby Khambat witnessed a profusion of Gothic influence in many of its buildings built during the 19th and early 20th century. 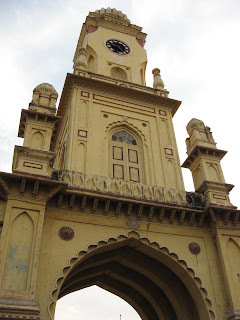 To our surprise we saw a mosque and a Shiva temple, both built in the Gothic and neo-classical style showing a high degree of fusion of eastern and western aesthetics. The mosque located within the wall of the Bhora pol is an architectural marvel with beautiful Corinth columns and Gothic arches, closely resembling a Catholic Church. 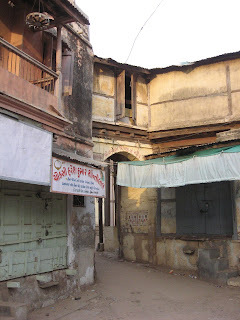 Pol is typical urban feature of the walled cities of Gujarat. Derived from the Sanskrit word ‘Protoli’ Pol is an urban neighbourhood – a cluster of houses protected by a wall and can be entered through a gate. The facade of the houses, which once showed beautiful wooden carvings, are now mostly replaced with cement and plaster. 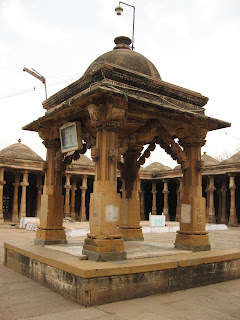 The walled city of Khambat is divided into two main clusters, the pol of the Muslim Bhoras and the Hindu and the Jain pol. Khambat is perhaps the only place in India, where the Harappan craft – the agate bead making is found in the living tradition. Surprisingly Khambat has no stone deposit. But the craft has survived mainly through acquiring stones from the Rajpipla hills, about 200 km away from the town. In the folklore of Khambat the beginning of the craft is attributed to Baba Ghor, a 1500 AD saint from Ethiopia who had led a large contingent of Muslims to settle in the town. However, in the archaeological record the origin of the craft can be traced to the nearby Lothal, a Harappan outpost flourished about 4000 years ago. 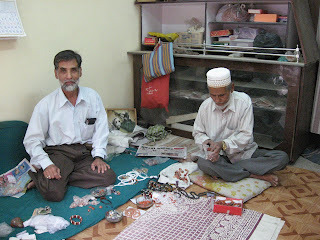 We met Khambati brothers, who own both a manufacturing unit and a shop for the agate products. Turned out to be quite knowledgeable about Khambat’s history and the bead industry they became our host as well as guides for showing the bead making process. Bead making is a complicated process involving several stages of development starting from procuring the raw material and finishing with drilling. Each stage requires a specialized skill and thereby different categories of people are involved in this cottage industry. Nasirbhai, the younger among the two took us to his house, which was filled with agate chips and kilns for heating the raw agate. Beside his house we met a person engaged in hammering the stone after heating. A special kind of hammer made of animal horn cores are used for the purpose. The next stage is grinding and giving shape followed by polishing, which is the most sophisticated and time consuming process. After rounds of polishing the stones become fit for drilling. 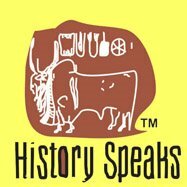 Looking at the complicated process one can imagine how developed was the Harappan craft when there was no concept of modern devises for cutting, polishing and drilling. But it is pity that despite of all the labour and skills the beads don’t much fetch substantial revenue. Before we left for Ahmedabad we strolled on Khambat’s Victorian corridor and came across a beautiful Church of the protestant group, which confirmed us the multi-religious character of this forgotten town.